Farewell, Nate & Kelly! We will certainly miss you both, and we wish you all the best in your new adventures out west. Thank you Nate for your fantastic fiddling, awesome energy, and great friendship! To all you Wall-Stiles fans: check back here periodically as we plan to regroup and explore other Wall-Stiles collaborations. Check out our debut CD, entitled "Passages". 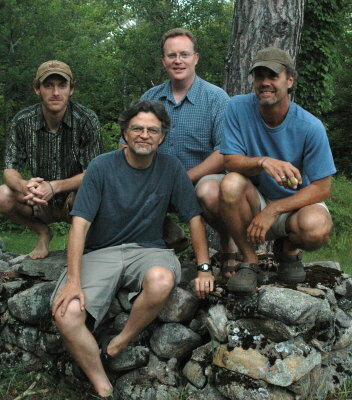 Hailing from central Vermont, the contemporary folk rock sound of the Wall-Stiles is original, energetic, and entertaining. Led by the varied music and lyrics of singer-songwriter Bruce Brough and his guitar, the band rocks with the expressive drumming of John Foster, the inspired fiddle of Nate Hamm and the smooth bass of Dave Barthel. Songs cover a wide range of sounds, from fiddle-screaming, high-spirited barn burners, to melodic ballads that highlight rich vocals and nuanced instrumentation. Come check us out this year!